The battle of the Blag Flag’s continues. Watch this new footage of FLAG, which is the non-Ginn party playing My War at Redondo Beach where it all started back in the day. 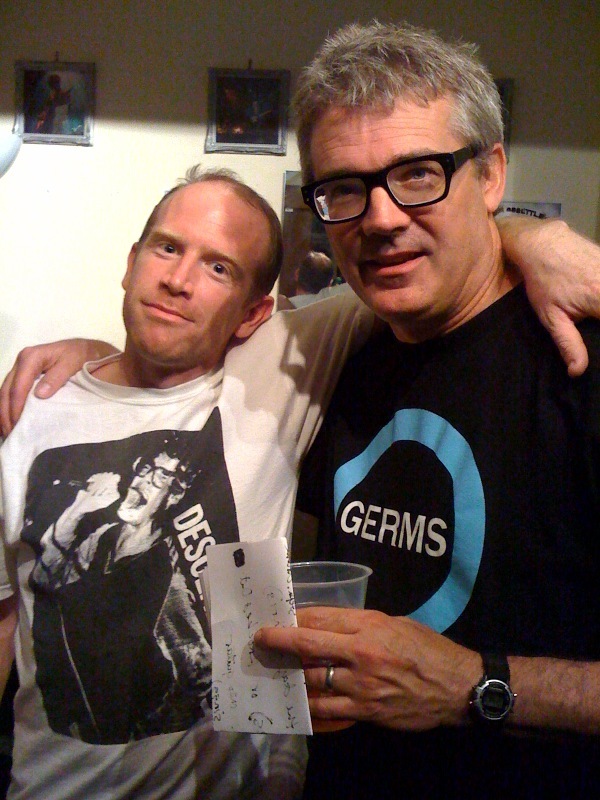 The news of Descendents returning to the UK after 15 years was so exciting that we bought tickets as soon as the show was announced and then sat on them awaiting their return. But nobody could have prepared for what they were about to see tonight at the Shepherds Bush Empire in West London as this was the gig that should never have happened. The band traveled through Europe playing the Groezrock Festival in Belgium and the Monster Bash in Berlin, both shows with glowing feedback on the web making the anticipation for this to be an absolute classic, but one thing they didn’t prepare for was Milo Aukerman‘s voice blowing out after these 2 shows and the band turning up to London knowing that they had to wing it. The support bands did their warm up sets, the lights went down and the four piece walked on stage to a rapturous applause that unfortunately turned to boos within 5 songs. Kicking off with the classic track Descendents, Milo’s voicebox unfortunately sounded like he was singing in a black metal band. He woofed his way through the track clearly uncomfortable with the situation and it only took 2 more songs of pain (Hope and Silly Girl) until Aukerman smashed his mic on the stage in a fit of rage with the remains of the broken metal spraying the remains across Stephen Egerton’s face. The crowd’s energy levels and anticipation was now going through a major change as anxiety and confusion replaced the high of seeing their fave band and the atmosphere became very awkward. Knowing they had big problems, the band walked of stage to discuss what to do next and instead of pulling the show there and then they decided to improvise the set they had planned and continued with others sharing mic duty. 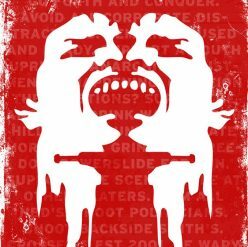 This inevitably made this show an instant car crash which is rare to see even in punk rock these days. A blonde haired singer from either one of the support bands or a crew member filled in to take care of vocal duties for Sour Grapes and I Don’t Wanna Grow Up but this brought boo’s from the now baying crowd who had now realised that the night was about to turn into a karaoke session instead of a Descendents gig. Everything sux tonight for many but what else could the band do other than to leave the stage? They had made their decision to play so now they had to try and get away with salvaging a nightmare. Nobody was going to win from this decision, some may say it was brave but others would say it would have been a costly mistake to pull the show. Despite all of these thoughts that were hushed in the crowd the band rolled on and you have to give them huge credit for trying. Milo was not bowing out though, he came back and took care of vocals (sounding like a foghorn) for Bear, Coffee Mug and I Like Food before rolling out a grimacing version of All-o-gistics and Enjoy before another punk rock huddle of decision making brought 3 Black Flag covers into the set with Milo now playing Bass, Bill Stevenson absolutely thrashin’ on guitar and Karl Alvarez did a grand job on the vocals as he threw himself on top of the front row playing Rollins. Thankfully, the boo’s turned to sighs. Booing bands at any gig is not exactly welcome, the same as when people boo their own team at a football match. It’s not as if these entertainers come out to deliver a bad job; everyone has their ‘off days’ but there were noticeable boo’s from a section of the 2000 crowd who had paid their money to see the Descendents and were now being treated to a cover of the classic Bloodstains by Agent Orange and a Zeke track. Out of all the guests who filled in on vocals tonight Eric Melvin from NOFX got the best reception after singing Bikeage and backed up on Coolidge. There were big smiles all round when he turned up with a mic in his hand. The show ended with Milo going through the pain barriers to sing Myage before the curtains came down to close a disastrous show for a very confused and emotional crowd. 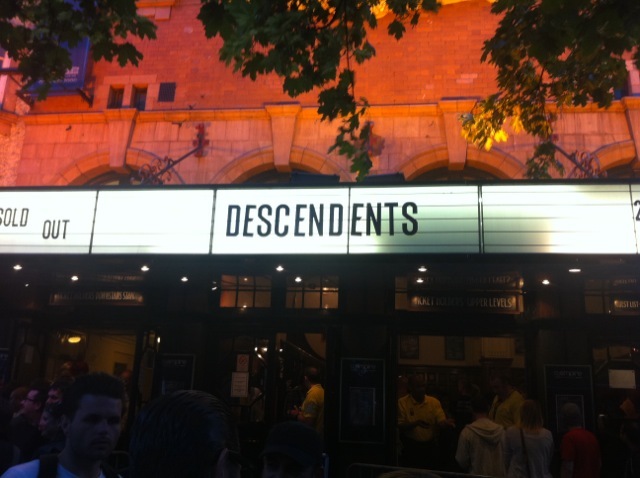 Realistically the Descendents made the wrong decision to play the show tonight and should have gracefully accepted that it was going to be a big ask to pull off playing in front of a packed London crowd who were ecstatic about seeing them play after all these years. Due to Milo’s work commitments I guess rescheduling would not have been an option but still, the golden rule is, if you are going to come back and recapture hearts and minds that have waited that long for a show, then at least turn up and do it knowing you have a fair chance of pulling it off rather than gambling on the fact that the crowd that had paid £20 a ticket could feel Sour Grapes. But if your glass was half full at this show then you would know that tonight the Descendents were definitely, “the proud, the few” for the effort, and certainly not “rockin’ alone tonight”.